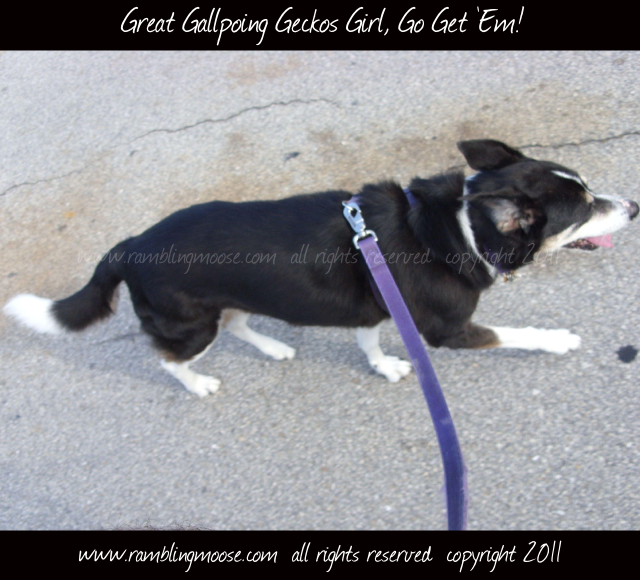 Rambling Moose: Great Galloping Geckos Girl, Go Get 'Em! Near my house is a park. Next to the park is a house that shades the walk. It's been adopted by anoles and geckos. Late in the afternoon, when the Florida Summer Heat isn't quite so punishing, the Anoles come out to the sidewalk to warm up before going back into hiding for a long sleep. That is where Mrs Dog comes in. You see, a Border Collie, or a Mc Nab Dog to be more accurate, is a study of measured intensity. Give them a job and they will do it. Things out of place must be made right. In the mind of a Border Collie, Lizards do not belong in the middle of a side walk. Lettie would put it right. If you have ever seen an Agility or a Fly Ball competition, you will see these dogs being held back and wound up by their owners. One hand on them to hold them back, the person encouraging adrenalin out of their charges, and the Dogs going wild with excitement and a frenzy of enjoyment at the up and coming task. In my case, it allowed these lizards to hear Mrs Dog go from sedate and steady companion to a furry black streak being wound up and doing something she almost never does - bark. As the frenzied barking and growling happened, my hand released the purple harness that she came with. At that very same moment, the Lizards fearing a giant black streak would approach and separate their tail from body, ran off into the brush. An eye blink later, Lettie was charging down the 100 feet of shaded sidewalk through a herd of scattering Lizards. Bending down while running at top speed, she'd Woof! at an imagined Lizard that turned out to be a leaf. Not realizing she could not stop immediately in full frenzied mode, she continued down the block, Bound! Bound! WOOF! until she arrived at the end of the property with a satisfied look. She had cleared the walkway. It was now safe for humanity. Cleared of the evil geckos, I could walk while being guided by my faithful companion showing the joy that you only see in a working dog who has successfully completed her task. That picture above was her walking beside me, a half mile later. The smile was unabated, this was pure Border Collie Joy.